I first encountered the work of Dietrich Bonhoeffer when I came across a battered paperback copy of his “Letters and Papers from Prison” when I was teaching at Kafue Secondary School back in my twenties. All I knew about him then was that he was put to death by the Nazi regime at the end of the Second World War and so I was intrigued to know what he had written. I understood little of what I read back then and was even disturbed by some of it. What kept me going was the integrity of his life and so I read and re-read that slim volume until it became a part of me. I offer you this reflection on the 72rd anniversary of his martyrdom. I could offer one or two minor factual corrections to what is written here but the essence is correct. I am even more certain now than when I first encountered Bonhoeffer that what he has to offer is vital to the life and faith of the church and the future of humankind. I offer this here in the hope that some of my readers may get to know him too. Welcome to the Holy Women, Holy Menblog! We invite you to read about this commemoration, use the collect and lessons in prayer, whether individually or in corporate worship, then tell us what you think. For more information about this project, click here. Dietrich Bonhoeffer was born February 4, 1906. He studied at the universities of Berlin and Tübingen. His doctoral thesis was published in 1930 as Sanctorum Commuunio. 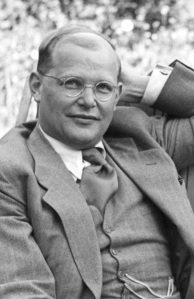 From the ﬁrst days of the Nazi accession to power in 1933, Bonhoeffer was involved in protests against the regime. From 1933 to 1935 he was the pastor of two small congregations in London, but nonetheless was a leading spokesman for the Confessing Church, the center of Protestant resistance to the Nazis. In 1935 Bonhoeffer was appointed to organize and head a new seminary for the Confessing Church at Finkenwald. He described the community in Life Together and later wrote The Cost of Discipleship.